Fittingly, the farewell will take place where it all began. Since their introduction in the 2009 SMTI production of Follie Holidays, The Four Reps have been entertaining audiences with their accappella/rock/doo-wop/barbershop group sounds. For those who don’t know, The Four Reps are Charlie Askew, Henry Melhorn, Jack Dowden and Matt Morley. Since 2009, they have representing The Reps’ young artists program and the Arkansas Repertory Theatre as they have performed all over Central Arkansas including the Clinton Library, the Governor’s Mansion, Little Rock City Hall, Barton Coliseum and The Rep’s Saints and Sinners Ball. The Four Reps have also spent time cutting two albums, winning the Arkansas Democrat Gazette’s Pops on the River competition to sing the National Anthem with the Arkansas Symphony Orchestra and recently opening for the nationally recognized Yale University Whiffenpoofs. But all good things must come to an end. The Four Reps will give their farewell concert on Arkansas Repertory Theatre’s MainStage on Sunday, July 29 at 7 p.m. Produced by Nicole Capri, Karen Q. Clark and Arkansas Repertory Theatre, The Four Reps will entertain with audience favorites from their repertoire as we say goodbye to two of their members, Jack Dowden and Matt Morley, who recently graduated from high school. Following the concert will be a screening of the film “Cain and Abel” (mentioned on yesterday’s Culture Vulture entry). A few tickets still remain, but they are going fast. Call the Arkansas Rep box office at 501-378-0405 or visit www.therep.org. The Weekend Theatre’s production of Pippin continues this weekend and runs through October 23 (which is the 39th anniversary of the show’s official opening on Broadway). Shows start at 7:30 on Friday and Saturday nights and 2:30 on Sunday afternoons. Tonight, (October 13), there is a special “Magic to Do” performance. Doors open at 6:15 p.m., with food and a chance to mingle with the cast, followed by a magic show at 7 p.m. featuring David Weatherly, assisted by other cast members. 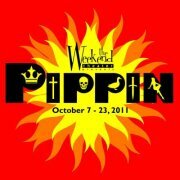 The performance of “Pippin” begins at 7:30 p.m.
Pippin is a fanciful musical by Roger O. Hirson and Stephen Schwartz. It tells the tale of a young man searching for his place in the world and his corner of the sky. The cast is led by Malcolm Glover, Craig Wilson, Julie Atkins, Byron Taylor, Charlie Askew, Evan Tanner, Pamela Crane and Patti German. John C. Thompson directed the production, which was first directed and choreographed by Bob Fosse.